A high over the North Island brought clear skies and frosty conditions to many places last night and early this morning. Waiouru dropped to minus 7, Taupo followed suit with minus 5, while Hamilton and Rotorua got down to minus 3. 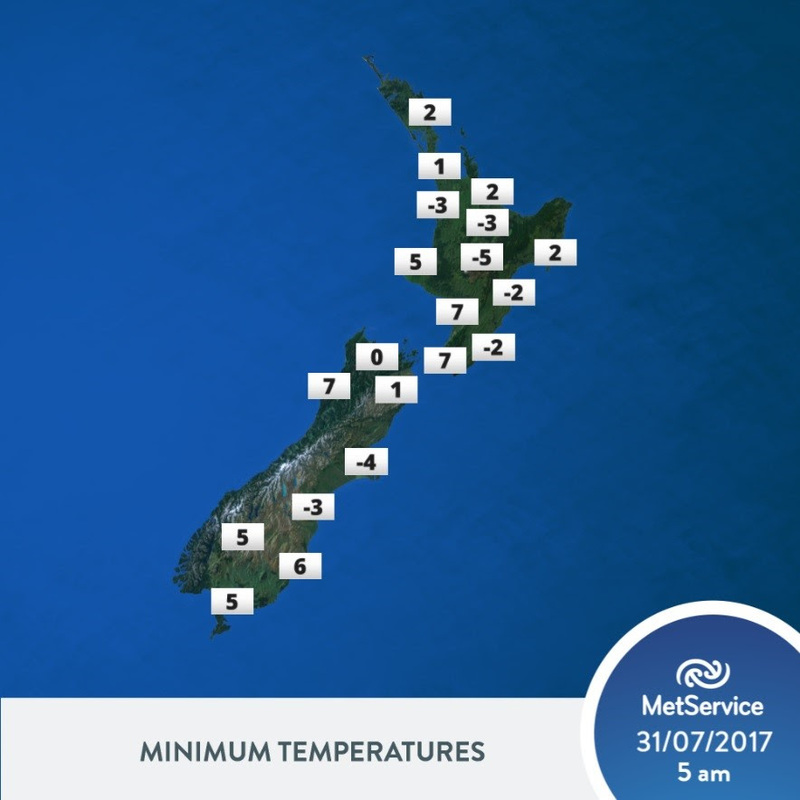 Even Auckland had another cold morning with Whenuapai, in the northwest, lowering to minus 2. However, that’s the last of the frost for many in the North Island, for now, as cloud and rain move in over the coming days. A front is moving up the South Island today, bringing heavy rain to the West Coast. “Rain warnings are in force for Fiordland and Westland,” said forecaster Tuporo Marsters, “then the front stalls across central New Zealand during Tuesday, with a rain warning also in force for the Tararua Range.” Meanwhile, a watch for heavy rain covers areas from southern Manawatu down to northern Wellington. Tomorrow, a low deepens off the Australian coast and is set to be this week’s next major weather maker. 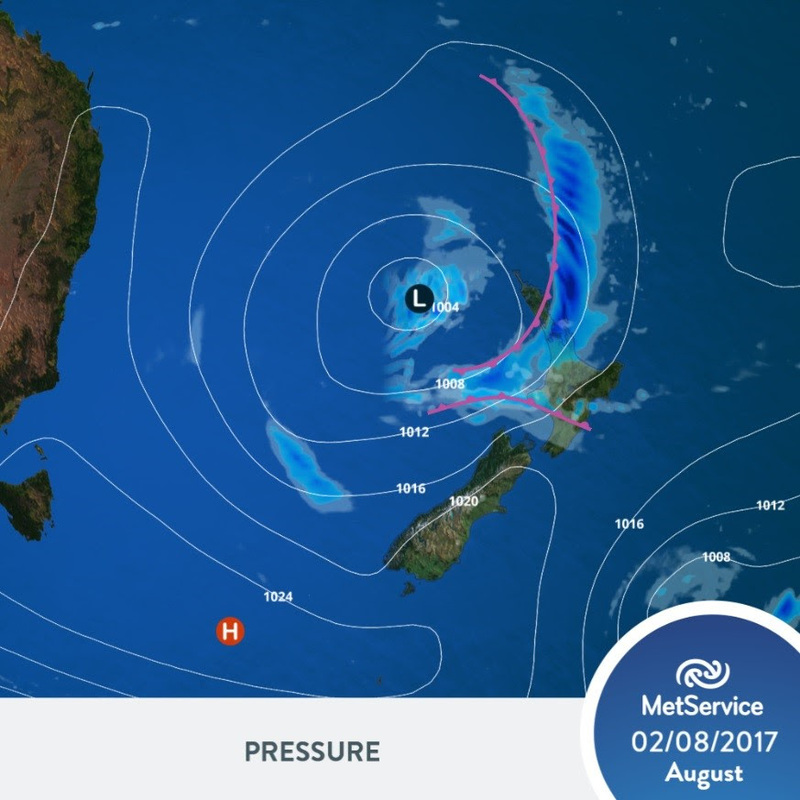 This low is forecast to cross the upper North Island during Wednesday and Thursday, bringing a burst of heavy rain and strong northeast winds from Northland to the Coromandel Peninsula. “With this rain falling on already saturated ground, surface flooding is likely – so keep up-to-date on the latest forecast and warnings,” commented Marsters. The good news is that the South Island misses the worst of the heavy rain mid-week due to a ridge of high pressure spreading in on Wednesday, allowing those soggy eastern areas some more drying time.